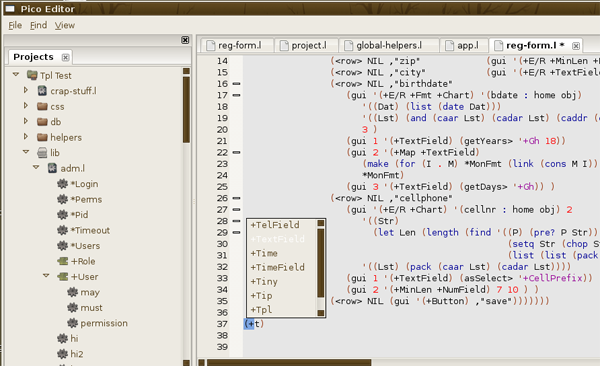 – Autocompletion with local, global and uberglobal scope. A whole project is now parsed recursively to create a list of classes, their methods and global functions and variables. 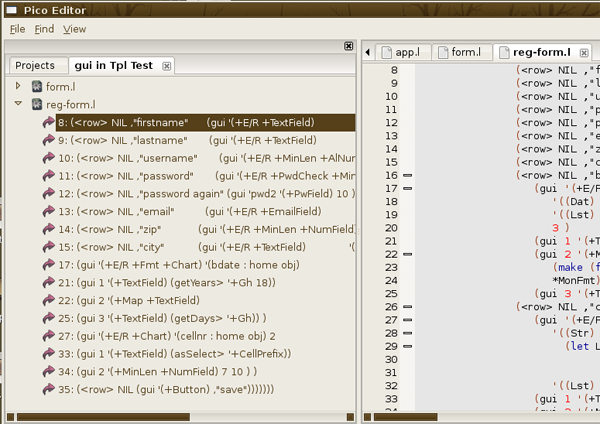 – Instant code jumping to the definitions of parsed words. – Partial string search in the whole project and in the current file, results display in a new tree with each file/line the partial is found in. – Project browsing with an arbitrary number of projects, with the following hierarchy: Project -> folder -> file -> globals/classes -> methods. Additional folders (libraries) can be added to each project. – The workspace is saved on quit and loaded again automatically the next time the editor is started. Icons from the Buuf set by mattahan. I simply love them. – Rebuild project tree/keyword list. What we have here is an AUI interface with two AuiNotebooks which are responsible for handling the tabbing, one to keep track of the project tree and search results and the other to manage open documents. Each open document is a Scintilla instance. This code is based on the AUI sample and as you can see we have transferred some stuff from the frame in the scintilla example. The AuiManager is responsible for controlling our panes (two notebooks). @pr_visible keeps track of whether the left pane is visible or not, it can be toggled on or off (more on that later). Note the use of evt_close in order to save the workspace on quit. We also keep track of when we close and switch pages in the right notebook. create_treebook is responsible for creating the project browser which is a TreeCtrl, the result is @project_tree which will finish off by loading the workspace (more on our special tree control in the next part…). puts "there is no support for creating new documents"
ProjTree and Scintilla are our extensions to the wxRuby defaults. Notice the use of :pico as the default lexer, creating some kind of default lexer and using that one is on the todo list. Also note that there is no functionality for deleting, renaming and creating new documents, I really don’t see the point in that, the convenience factor is minimal compared to just using your favorite file explorer in a separate window. The ProjTree constructor can take another tree as input, this is the basic mechanism behind the resultant trees when we search for instance. In that case we just pass the project tree to the new tree so that it can use its data when generating its own content. Simple way of always making sure we have the current Scintilla instance handy in @sci. When the software is killed we save the currently open files in a YAML config file so that they can be retrieved next time we start. onToggleBrowser will keep track of whether the left pane is visible or not and toggle it. toggleSaved will display an asterisk after the file name of each file that has been changed since last save, most of this logic is handled in each Scintilla and we will get to that in a subsequent article. Our two search functions. We pass the project tree to each new TreeCtrl like I said above. Here we check if the document has been saved or not, if not we ask the user if he wants to close it or not, if not we abort. Note also that we have to make sure that it is the right notebook that generated the event, the above code will make no sense when we close tabs in the left notebook. And there it is, the main entry point and loop, not really exciting but I promise you, the next article is a lot sexier because then we discuss the code for the ProjTree. This entry was posted	on Sunday, May 18th, 2008 at 3:44 am	and is filed under Ruby, WxRuby. Comments are currently closed.